The Schwab Foundation for Social Entrepreneurship, a sister organization of the World Economic Forum, in partnership with the Jubilant Bhartia Foundation announced Poonam Bir Kasturi of Daily Dump, as the winner of the Social Entrepreneur of the Year- India 2015 Award. According to government estimates, homes generate 75% of all organic waste produced in urban India. Daily Dump targets to manage this waste right where it is generated – within families. Daily Dump, has brought together design thinking, traditional pottery and the science of composting to develop more than 50 aesthetic products and services that enable urban Indians to compost their waste at home and be part of the solution to the country’s waste management. 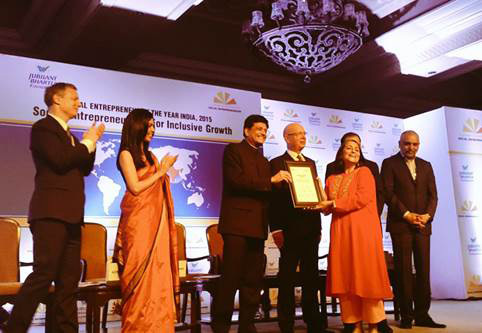 Shri Piyush Goyal, Minister of State (Independent Charge) for Power, Coal, New & Renewable Energy Government of India complimented the winner, Poonam Bir Kasturi and other finalists- Ashraf Patel, Prema Gopalan and Suparna Gupta, for their outstanding contribution to the society. They deserve the highest accolades for the work they are doing and are the true women of substance. He also appreciated Schwab Foundation and Jubilant Bhartia Foundation for their efforts in recognizing social entrepreneurs in India. The winner will be invited to join the Schwab Foundation’s global community of over 300 social innovators. Social Entrepreneurs are driven by their mission to create substantial social change and promote inclusive growth, developing new products and service models that benefit underserved communities. Pravah is building vibrant eco-systems across India to launch young social entrepreneurs, changemakers and active citizens and propel their models of positive social change. Pravah has pioneered a unique youthentric approach to development called the ‘5th Space’. The 5th space rejects the instrumentalization of youth for political, economic and development gains. Instead, it focuses on transforming the youth and building their leadership potential to then transforming society through them. Working with the most vulnerable communities of climate change and disaster-affected areas, the SSP group of ventures is building a new generation of disaster-resilient women entrepreneurs and grassroots women community leaders. Over two decades, it has equipped more than 70,000 women to partner with global and local businesses and architect sustainable rural social businesses - in clean energy, sanitation, basic health services, nutrition and safe agriculture. This has opened up new markets, non-traditional livelihood incomes, tripled household incomes and revitalized ailing village economies. Aangan Trust is converting India’s hot spots of child violence into communities that are safe and responsive to children. It works with the full range of actors and institutions that a vulnerable child encounters – both before and after the occurrence of harm- and transforms them into child protection champions. In communities marked by intense poverty and violence, Aangan sets up local, child safety circles that are powered by unusual allies- parents, government officials and young change makers.